2018 ‘the most incredible year’ says BTCC rookie Thompson. With the dust having settled on the record-breaking 60th anniversary 2018 Dunlop MSA British Touring Car Championship, Bobby Thompson is determined to return to the grid in 2019 after ‘the most incredible year of my life’ in Britain’s premier race series. And while the results sheets will show just a trio of point scoring finishes from the packed ten round, 30 race schedule in his debut year, the bare bones of the results sheets don’t do justice to many of the performances put in by the 22 year-old Hornchurch based driver and his #19 Team HARD with Trade Price Cars team. 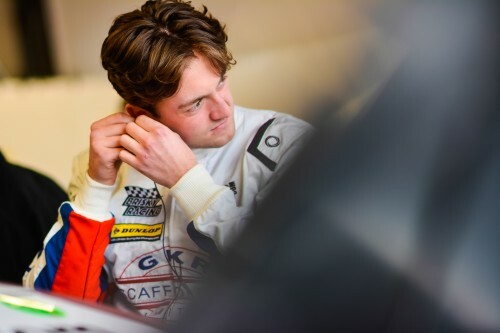 Thompson’s final position of 28th in the overall Championship with 23 points was eclipsed by his performance in the Dunlop Forever Forward standings, which saw the current BRDC Rising Star gain no fewer than 127 places during the course of the year, good enough for fifth place overall. Thompson’s DFF progress began in the very first race of the season in damp conditions at the Brands Hatch Indy circuit, where he translated a 27th place qualifying effort into a 19th place finish and while other top 20 finishes would follow at a frigid Donington Park and a baking Thruxton, it wasn’t until the spectacular Diamond Double meeting at Snetterton where he would open his championship account. “The first weekend at Brands Hatch is just a bit of a blur,” added Thompson. “I didn’t think I was that nervous at the time but it is only after the weekend had finished that I realised how much pressure I had put on myself and how different I felt on the Monday after raceday. Looking back now I can see where I made little mistakes, like running wide in the third race at Brands which cost me a few places and stalling on the grid in race two at Donington when we were starting in the top 20. Although Thompson didn’t leave the following round at Croft with the maiden championship point, his fighting drive in race three from the back of the grid to 21st was a sign of things to come in the first two weekends back after the BTCC’s summer break at Snetterton and Rockingham. True to his statement, Thompson’s season certainly kicked into high gear in the races that followed as he drove from the back of the grid in greasy conditions to take his maiden championship points in race two and then bettered that performance by going from 28th to 10th in the extended, double-points ‘Diamond Double’ race. More was to come in the following round at the Rockingham Motor Speedway for after putting in his best qualifying performance of the year to place the #19 GKR Ltd backed machine 18th on the grid, Thompson was on course to score points in race one before a mechanical problem cost him a lap and then charged through from last to 8thbefore being taken out in a crash in race two. Undeterred, Thompson put in one of the drives of the season in race three to pass more than 20 cars and cross the line in a career best seventh place, much to the delight of both driver and team. Unfortunately there were to be no further point scoring drives in the remaining three race weekends of the season with an engine failure in qualifying at a sodden Knockhill, two retirements as a result of contact from other drivers and a driveshaft failure at Brands Hatch putting paid to his chances. However Thompson gave him growing legion of fans a timely reminder of his untapped potential with a sterling drive from 31st to 19th in the 30th and final race of the season around the fabled Grand Prix circuit at Brands, passing no less than three BTCC champions in the form of Turkington, Neal and Jason Plato as he did so. “I think I was so pent up that it wouldn’t have mattered how the car was handling I was determined to pass as many cars as I can,” added Thompson. “I knew the pressure was off Colin but at the same time I didn’t want to be the one who punted the reigning champion out of the way. “I know it wasn’t for a championship point but the final race felt really good and it was a good way to say thank you to my mechanics and family for all the work they have put in this season.